When I awoke this morning, I got a glimmer of optimism and thought I felt a bit better. I even tried to plot out whether I could fly in tomorrow or the next day to meet my trekking friends. Within 30 minutes though, things regressed and I realized it might be time to toss in the towel or at least the boots and socks. You see, though my energy is slowly returning, there is something almost equally important to a mountaineer missing. That is my balance and clearheadedness. Since flying down, there has been something wrong with my equilibrium. I am frequently dizzy. I frequently stumble and almost trip. My mind is thick and impaired. I don’t like it one bit. I thought, at first, rest/sleep might change it but it seems to be hanging stubbornly about. I can’t climb or trek safely when navigating a city block is a challenge and taking a bad fall is a reality. I thought I could keep waiting for it to shift (which it hasn’t much in five days) as well as look into changing my flight home and to my surprise, there were seats tomorrow so I’m headed for home and my own medical team to sort out what’s on the go. I have a similar boot picture from 2007 and 2010. Linda Cox has painted me a beautiful rendition of it. I took this pic on the way up. I don’t even have my boots. They are still at base camp but the sentiment is still there. It’s been a good journey. I climbed high. Not as high as I wanted. But high. I slept higher than I ever have before. I saw beautiful views and I worked hard. I got taken out of the game by some combo of altitude/illness issues and that’s how it goes sometimes. 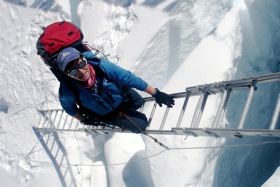 It’s one of the few times in over 20 expeditions that altitude overwhelmed me. Its humbling, its disappointing, and it is what it is. Thanks for your support and I’ll be back in St. John’s sometime on Friday. Oh TA, my heart goes out to you. On a much smaller scale I know that feeling of holding onto HOPE until the bittersweet realization that what you prayed to shift or to become miraculously possible was not going to go in the direction you yearned for with your whole being…to accept the reality of the moment. To make the wiser choice in the moment because to choose otherwise could have such immense consequences. This take so much courage. You are so courageous in so many ways. And then to have the grace and spirit to see the blessings and joys of the journey. I am honored and humbled to witness & share in some small part of your journey! I hope you heal easily & quickly. Safe travels home! I can’t wait to see you at AEE in the Twin Cities and to give you the biggest hug full of LOVE! Your courage, as always, awes and inspires me, TA. Love to you. A wise and courageous decision….so happy you are safe. Travel well. Big hug. I wish you a safe journey Homa and health.namaste ! Your safety is number one. Be as proud of yourself as everyone else is! Safe travels home. You have done well. Be proud of your accomplishments. Come home now and get your health back. TA, “High Five” to you, on this good journey you have surpassed other highs to higher again! 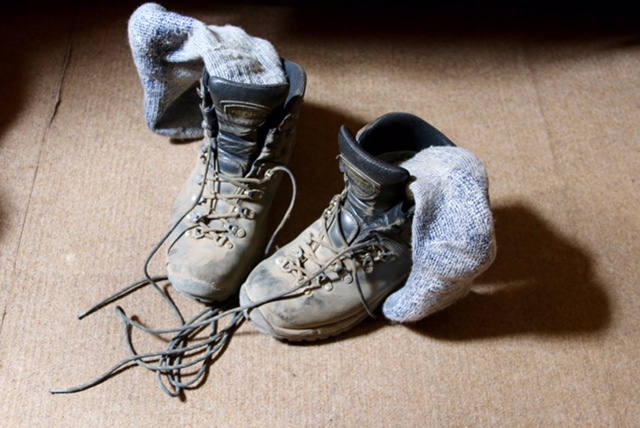 Safe travels and get well and get back into those mountain boots soon! No doubt a very difficult decision but from the sound of it, the correct and wise one. May you get home and safely and thoroughly recuperate. I have enjoyed reading your account. You are a most optimistic and up-beat person. Always a pleasure to witness such individuals. Have a safe journey home TA. It was awesome to follow your trip – you have lots to be thankful for! You ARE totally awesome! It was a hard decision but the right one for you right now and I wish you safe travels home. I hope your medical issues are quickly and easily resolved. Ms. Green and the Grade 2 class at Holy Family Elementary in Paradise, NL. You are still my inspiration TA. I have to work around my physical limitations and “watching” you give it your all pushes me to try again every day. Superior effort, TA, you gave it you all! TA, u r smart to come home. U gave it ur best. U climbed very high. U r the female equivalent of a stud! Be proud of what u accomplished – u motivated hundreds of people to dream n go for their own Everest, n not least, u got really far up the actual Everest! I’d say u were VERY successful! Safe travel home n please keep posting. Congratulations, TA, on accomplishing so much on this climb and for having the wisdom to toss in the boots. I feel a smidgen of your disappointment, though. I wish you a speedy and complete recovery. You’re a pretty courageous person TA! We are so proud of you! We hope you feel better soon. We have enjoyed following you each day. You have taught us a lot and we love you! T.A, we are so proud of you for doing so well on Mt. Everest. We are sorry you are disappointed but we loved following your posts and looking at your amazing pictures. Have a safe journey home and we look forward to seeing you again. Your cheerleaders in grade four at Bishop Feild School. I understand your disappointment. But sleeping at 7000 m? WOW. You should be proud of you. And you did more than set a personal record: you inspired a lot of people with your thoughtful posts. Great job! Safely home and alive to climb another day – it could be worse! Your adventures are far from over I’m sure, so I feel it’s okay to wish you congratulations on your valiant attempt and happy trails in your next pair of boots. A big goal of mine is to see Mount Everest with my own eyes. Thanks for showing and teaching me so much over the last few weeks. You’re so lucky to see and experience the beauty there. Your efforts, determination and drive are inspiring, as is your humility and ability to back down when necessary. Safe travels home TA, and I look forward to crossing paths soon.